If you’re considering an entry door remodel in Scottsdale the below tips should help you. Acquiring the door you want is simple as giving a call to Artistic Alloys & Design. We can design and fabricate any type of entry door, from the most basic and practical to the most elaborate and ornamental design you can come up with. This makes us the go to source for Scottsdale entry doors as we will design, build, and install any style of entry door of your choosing. With a home remodel and improvement project having new entry doors installed takes a small amount of planning. Preparing for the budget is a big part of it while also deciding what material and design for your home, or business. 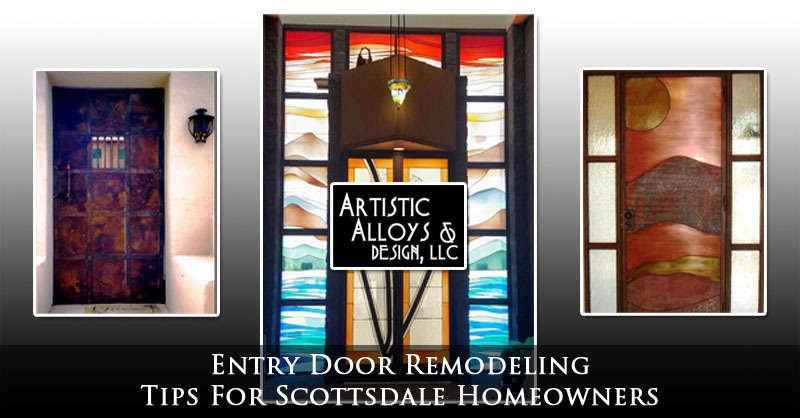 The easiest way to get started on installing entry doors in Scottsdale is to have an entry door installation consultation with Artistic Alloys & Design. We can assist you in selecting your design, materials, and help you create a reasonable budget for your entry door remodel. Entry doors can be made from an assortment of metal alloys, wood, and wrought iron. Artistic Alloys & Design can build your entry doors from one single type of material or a mixture of them. We specialize in delivering designs into reality and offer complete custom design and fabrication. Some common materials entry doors are made of include wood, stainless steel, and wrought iron. We will help you select the correct material to match your home or business. Some other architectural elements near your home or business entryway should be integrated into your entry door material selection, so your new entry door will fit into the tone of your home. The overall design of your entry door should match the personality of the property. If it is a place of relaxation, the style of the door should express that story. On the other hand, if it is an entryway to a diamond store, the door style should be hefty, imposing, and leave absolutely no doubt that the doors are built to endure even the most intrusive abuse. You’ll able to choose from a wide range of themes that include popular elements from nature, geometric shapes, and other visually elegant design elements. The entry doors we design and build are some of the most impressive in the state of Arizona. It is our every intention to give our clients the design input and control necessary to get the exact doors they want for their property. A big part of getting a custom entry doors is planning for your budget. While some property owners will simply have the money to pay for the door upfront, others might need to save up a little or take out a home improvement loan. While just heading down to your local home improvement store or hardware store and picking one up is cheaper, so are the doors they sell. Investing in a quality made entry door from Artistic Alloys & Design will increase the security, value, and overall appearance of your property. To find out what exactly your entry doors will cost so you can budget properly or get a small home improvement loan you should have our team come out to your property. Our experts can measure the entryway, go over which materials and design you love, and get you a realistic idea of what it will cost to design and install your new entry doors. Our quotes always include the full cost of the project including the design, fabrication, delivery, removing the old doors, and installing your brand new custom entry doors. Copyright © 2019 Artistic Alloys & Design, LLC. All Rights Reserved. Website Design, Hosting, Maintenance & SEO by WebTechs.Net.